Ever read a book with a lot of expectations but left feeling meh? 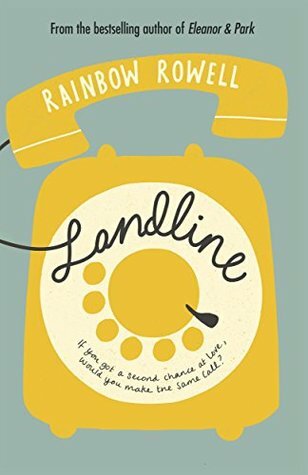 I typically get along with Goodreads recommendations as I find them pretty accurate, but their book of the year 2014, Landline by Rainbow Rowell left me very underwhelmed to say the least. Over 46,000 people voted for it as Book of the Year. To stalk what I read on Goodreads, click here. The book is essentially a journey of Georgie talking to her husband in the past and she struggles with whether she should rekindle that relationship during an earlier breakup. I liked all the relationship questions it posed and resolved but that's all that was good with it. She speaks to her husband through an old telephone (that somehow calls him in the past on a telephone that he no longer has, and she can't get hold of her husband in the present as he's either always out or the children drains his battery by playing games on it). And that's my main gripe with it. It's not a fantasy book, nor magical in any sense so this *special* telephone really doesn't make any sense. The book was pretty juvenile, although I did really like Neal's character (a bit too ideal to be real, e.g. he gives up everything to become a stay at home dad so that his wife can go back to work and not feel guilty about having to put the kids in daycare, makes food for Georgie no matter what- even when he's angry at her, loves her unconditionally). In short I would never have picked this book up from reading the blurb as I am really not a fan of chick lit (I'm sticking it in the chick lit category), and only read it becomes it was Book of the Year. In my honest opinion, you can skip it, as it was pretty pants. #SorryNotSorry but it was a waste of my time and I feel well peeved at it being Book of the Year as it's beyond unworthy. Moving on, what was the best book you read in 2014? Do you even read books? Leave your recommendations below.